So! onto the more exciting part of this post haha :D - I have decided to celebrate my third ever giveaway by giving away three prizes, which means there will not be one... but THREE winners :) - I honestly wish I could give you all a little something, but I thought by having three prizes, then at least it would give people more chance of winning my giveaway. I also wanted to do a Makeup, Hair and Skincare themed giveaway, as I thought this would fit in really well with my blog content. Prize 1 - Chanel Glossimer Of Your Choice! Chanel Glossimers are one of my all time favourite products, and I always have one in my makeup bag. I love their lovely and non sticky texture, as well as their beautiful Colour range. I thought it would be lovely to giveaway one of these lip glosses and the winner will be able to choose their shade from the website Debenhams. Elemis is one all my all time favourite skincare brands and I was thrilled when Elemis said they would like to give me a discovery kit to give to one of my lovely followers as part of my 1000 giveaway. The FreshSkin range is absolutely gorgeous and this discovery kit would be a great way to try out some new skincare. Please note that the other two prizes are being fully purchased out of my own money. If you are a regular reader you might have noticed recently I featured this product in my "hair care" post which you can find below. I'm absolutely loving this product at the moment and have seen a huge difference in my hair, so I thought this would also be a nice product to giveaway. - Please comment below with what you would like to win and why ? I'd love to win a Chanel Glossimer as I love experimenting with lip colours! Congratulations on reaching 1000 followers hun, your blog is so great and you were a big help to me when I started so you deserve it! I'd love to win the lipgloss! Congrats! I would love to win the Elemis gift set! - I've never tried Elemis before and I love to find new brands (and I need a little help with my skin!). I would love to try Prize 3! Id love to win Prize 1! I'd love the Elemis Kit as I've not tried it anything from this brand, and I'm craving to! Congragulations I love your blog !!! Congrats hun! I'd love to win any of them to be honest but I'd really love to try the chanel gloss! The Elemis set! I have such bad skin. What an amazing giveaway, congratulations! I would love to win the Elemis set as I'm always wanting new products to try out! Amazing giveaway, congrats! I'd love to win the Chanel lipgloss ! I would love to win Prize 2, it's super cold in Ireland and my skin needs some tlc. I would like to win Prize #1! Well done on the followers hun! Lovely prizes!!! I would go for prize 1 as you can't go wrong with a bit of Chanel. I'd loooove to win Chanel Glossimer! Great prizes and post! I just recently found your blog and added myself to your list of Followers. Would you be willing to follow me back as well? I would LOVE to win the Chanel Glossimer! Thanks & congrats to reaching that mark. Congrats! I would love to win the Chanel gloss. Congratulations and many more followers!! Great Ga hun!!! I would like to win the Chanel Glossimer. I would love to win John Freida Full Repair Intensive Mask,because i need to repair my hait! I would love to win the Chanel lipgloss! Congratulations on reaching 1000 followers! I'd love to win any of these but maybe the hair conditioning mask most... Just what my hair needs. Thank you for this giveaway - wish me luck! They are all lovely prizes, but I think I would like the Elemis FreshSkin Discovery Kit. I have found one skin care range that I love, but this is one that I have never tried before. And congratulations on the 1000 followers, i'm sure there will be plenty more! amazing giveaway!!! immediately saw the chanel lip gloss and got so excited! i entered! I love the Elemis set! I love the elemis set too - but such amazing prizes. congrats on getting over 1000 hun. i would love to win chanel gloss as i have only tried 1 chanel thing before haha. cant wait to try more. I'd love to win John Freida Full Repair Intensive Mask! My hair needs it! I'd like to win Prize 2 because I have some skin issues and mybe this skincare brand would help me to resolve it! I would love to win the 1st prize "Chanel Glossimer Of Your Choice"
I would absolutely love to win the Chanel Glossimer in the shade Jalousie if available! I'm such a huge lip product addict, (you've just commented on my 32 MAC lipsticks collection blog post and that's only the start! I'm addicted; it would be so great to win! I would love to win the John Freida Full Repair Intensive Mask. My hair has been going through a phase & I would really like to try out this product. But because I don't have access to it, I never thought I'd be able to try it out. I would love you forever <3 haha! I would love to win the hair repairment product! Congrats on your milestone. Thats amazing. Keep it up! Congrats on the milestone lovely! Thats amazing you should be very proud :) I'd love to win the Chanel Glossimer! Congratulations on reaching 1000+ foloowers! This is such a fab giveaaway, you really didn't have to do it! Personally, i'd love to win the Chanel lipgloss as i've never tried any of their lip products before and they look like such fab shades! Wow great news on having over 1000 followers :) Thank You for such an amazing giveaway too! I'm quite torn as Elemis is my favourite skin care product & Chanel is one of my fave make up brands, I think I'd like Elemis for 1st choice & then Chanel in Bonbon for my 2nd choice if I'm a chosen one lol! I would love to win a Chanel Glossimer too, and would love to let my daughter choose one. I would love to win the Elemis set, as I have always wanted to try this brand but never have!! I'd love to win prize #3! I would love to win the channel gloss :). congrats on ur milestone lovely! so deserved! i think if i was lucky enough to win i'd have to pick the chanel gloss as i don't own anything chanel and i'd LOVE LOVE to try it out! Elem is FreshSkin discovery kit. I love trying new skin care products. I'd love to win the Elemis Fresh Skin set, these days my skin is behaving so terribly and I'm breakin out into acne. I think I need a new skin care regime to tackle my delinquent skin. To be honest I will be happy with any prize at all. And congrats on 1000 followers! Congrats on 1000 followers (Now nearly 1200!). I would love to win a Chanel Glossimer, never tried a Chanel Gloss. I'd like to try Prize 3! 1000 WOAH, what a feat!!! The elemis skin system looks pretty snazzy, so I'd like to win prize 2, please. Would love to win the Chanel Glossimer because I have never tried it! I'd like to try the prize 2 kit! Prize 2 - Elemis FreshSkin Discovery Kit!!!!!!!!!! I would love to win the Elemis FreshSkin discovery kit! Congrats on all your followers! Entered! I'd love to win one of these amazing prizes! Congratulations on your 1000 followers, very well deserved! I want to win Prize 1 - Chanel Glossimer. Congrats!I would love Chanel Glossimer in any pink shade as I never owned any Chanel products! Congrats Dear.. I am in Chanel Glossimer is too tempting..
Congratz on the 1000 followers! I'd love to win any of these amazing prices because I never win anything! To win the Elemis FreshSkin Discovery Kit would be amazeeeee! i like to win the mask. i would love to try Chanel glosses! They look superb! Congratulations lovely, and what fab prizes. I would absolutely LOVE to win the Elemis skincare, as I've recently spent out a fair bit of money on two different cleansers, only to find that they broke me out. It's not even a common problem for me, but I should have researched the ingredients properly first - lots of comedogenics in them :( So I am in need of something to sort me out! All the prizes are amazing, I'd love to win any of them! I'd love to win the lip gloss because it looks so good, and I practically life on lipgloss. I'd love to win Elemis FreshSkin Discovery Kit! i would love prize 2!! Would love to try the Chanel lip gloss. Thanks for the chance! I love this giveaway! The products are so posh. Great taste girl! I would love to win the chanel glossimer as never used a glossimer by them before and i would love to! Hi, I would like to win the Chanel Glossimer. I would love to win the Elemis gift set! Would love to win prize 2 :) Great giveaway. Congratulations on the followers! I can hardly choose, I love all of these prizes! But I think I'd love the Elemis kit best of all. My skin definitely needs some care, fast. Chanel Glossimer or Elemis FreshSkin Discovery Kit. Congrats and thanks for the giveaway! Well everyprize is so amazing, cannot choose just one. Congratulations on 1000 followers lovely - it's well deserved! 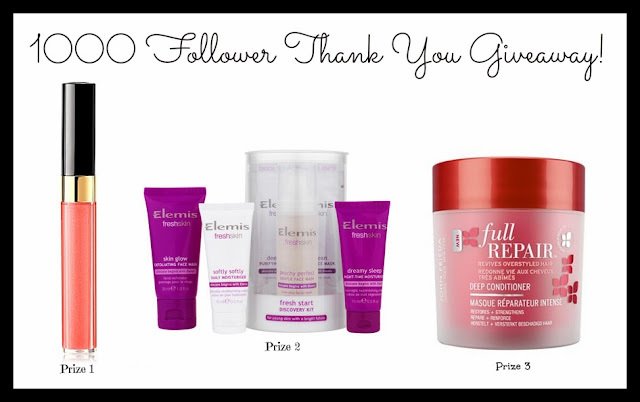 Great giveaway, I would love to win the elemis skin care as I haven't tried anything from their new range yet. I'd love to win Chanel Glossimer.